Professor at Department of Visual Arts and Design, University of Barcelona, with PhD in Fine Arts and expert in Cinema, Video and New Media. Coordinator of the Lab-Media <http://www.lab-media.net> and of the Mediateca of Image <http://www.ub.edu/mediatecaimatge> at the Faculty of Fine Arts, University of Barcelona. Researcher of the projects I+D+i, “Meta Método I” and “Meta Método II”. Member of the research group IMARTE. Director of the Project “On Riu Llobregat” (2008-2011); Director of the Project of teaching innovation “El archivo audiovisual como actividad docente innovadora” (2012-2014). Among several publications of articles in journals, conference proceedings and catalogues, he authored Introducción a la tecnología del video (Universitat de Barcelona, 1982); Catàleg de la producción video gràfica a Catalunya 1970-1985 (Departamento de Cultura de la Generalitat de Catalunya, 1986); El video de creación, 1960-1984, (PhD thesis), 1989. In 1977 co-founded the first collective of independent video in Spain – Video-Nou – that 3 years later became the Servicio de Video Comunitario. In 1982 created with Manuel Huerga, the department of video of Joan Miró Foundation in Barcelona. 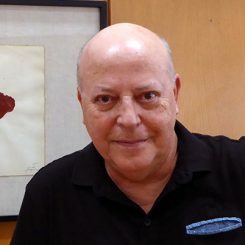 He was curator of several exhibitions of video and electronic art, among them: 1ª Bienal de Video de Barcelona, 1987; Muestra de Artes Electrónicas, 1998 and 2000, in Centro de Arte Santa Mónica in Barcelona. He has been member of many national and international contests and festivals of video.